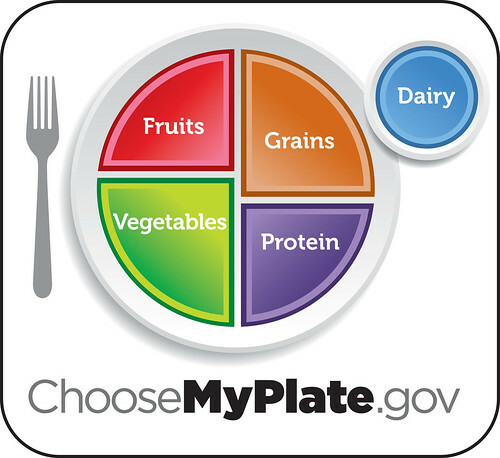 The U.S. Department of Agriculture’s new MyPlate illustrates the the principle that whenever there is something new, there is good and bad. I think that the old food guide pyramid had some helpful information, but did not cover proper portion sizes thoroughly. The new MyPlate illustrates how to eat a well-balanced meal, but still misses some opportunities to teach Americans about portions and eating small meals throughout the day. I recently participated in a conference call with other registered dietitians that featured plenty of heated debate over the pros and cons of both the food guide pyramid and MyPlate. I thought I’d share some of what I heard here. Easier to understand for adults and children compared to the food guide pyramid. The RDs felt the colorful plate would really help parents teach children about a well balanced meal. Stresses fruits and vegetables, which Americans don’t eat enough of. Of course, all the dietitians loved this part of the plate. Presents better balanced meals with interactive tools to identify how much you should be eating of each food group. One RD simply asked, how big is MyPlate? This comes back to teaching about serving size and portion control; how much I should have as a 5-foot-1-inch female is very different from what my 5-foot-11-inch husband should consume. One of my biggest issues with MyPlate is the confusion that can occur if someone is eating five or six smaller meals per day. Americans should not eat this entire plate six times per day unless quantities are very, very small. There is no mention of the ideal quantity for each food group nor how often one should eat them. MyPlate identifies the healthier food groups, but as one RD exclaimed, “Where’s my Doritos?” Truth is, Americans are going to eat their fats and desserts, so teaching how to account for them is important, too. The now outdated and much-criticized Food Pyramid. Provide a better understanding of the total amount of food one should consume from each food group compared to MyPlate. All food groups — good and bad — are included. One dietitian mentioned that just because we are supposed to consume oils, fats and sweets sparingly, new formats shouldn’t remove them, since that’s not how Americans eat. Another RD appreciated the effort to include physical activity as a part of the illustration for the last revision of the pyramid (see the stick figure climbing the stairs). No education regarding how to balance meals properly. A fellow dietitian stated that if she didn’t know better, she would think that the goal is to eat meals with only one food group at a time. While the pyramid provided information regarding the number of servings, it did a poor job explaining what the size of a serving should be. This is a common problem when dealing with balancing meals. I always thought that if people could understand serving sizes relative to their body types and not to their eyes, Americans would be healthier. The general consensus on MyPlate was that by listing only one nutrient in each food group, the food groups are not clear and concise. For example, cheese can count as dairy, but it also contains fat and protein, so which category to put it in? Then there are grains, which are the main source of carbohydrates, but some of them also have protein too, like quinoa. Also, many meals are a combination of foods, so learning how to account for that in proper portions is key. In the end, I think MyPlate can be a useful nutrition tool, but it has to come with more explanation and education so users can better understand how to apply it properly. People have different physical characteristics and different goals, from weight loss to weight gain and more. What do you think of the MyPlate tool? What do you think would help Americans understand it better and use it more effectively? I can’t wait to hear what you think. Will MyPlate become your plate? i know that my plate is the more new model of the pyramid what i want to know is that in the future will there be another new model that will be better than both the pyramid and the my plate? MyPlate app unfortunately does not track sodium intake correctly and in fact, is completely off. This becomes an issue when treating a hypertensive patient with weight loss and diet emphasizing on a low sodium diet of no more than 1500 mg a day. Would not recommend this app due to this issue. Planning Healthy Meals Easier With New ‘Food Plate,’ But Where’s the Bad Stuff?